As an undercover special agent for the U.S. Customs Service, Robert Mazur ’72 played the role of Robert Musella, a wealthy, mob-connected businessman. What kind of a man can pull off such a high-wire act? That was the question I kept pondering as I read page after nail-biting page of The Infiltrator, Robert Mazur's account of his life as an undercover government agent and the basis of a new movie, released in July 2016, starring Bryan Cranston. (Read a book excerpt here.) Posing as a mob-connected businessman, he infiltrated the Medellín drug cartel and the dirty banks that serviced the cartel's financial needs. To succeed in this assignment, the 1972 Wagner business graduate had to be many things all at once: First of all, he had to be an entrepreneurial businessman and expert accountant, capable of executing foolproof money-laundering systems. He also had to be the most convincing kind of actor — one who was able to gain enough trust from his audience that they would put millions of dollars into his hands and give him access to their secret underworld. Yet amidst all of this scheming and acting, he had to stay focused on his ultimate goal as a lawman: gathering the evidence that would bring these criminals to justice. Mazur stuck to this goal with hard-bitten determination, even when people inside of law enforcement undermined the operation, never mind the drug lords' threats. So, when I met Bob Mazur for an interview, I expected someone who would come off as rather imposing — someone like a hard-boiled detective, someone with ego to spare. A mixture of crime and honor runs deep in Bob Mazur's family history. In his memoir's first chapter, he relates a “cautionary tale” told to him by his mother: “My great-grandfather, Ralph Cefaro, ran a sham moving company on Manhattan's Lower East Side in order to transport bootleg whiskey during Prohibition for Charles 'Lucky' Luciano, one of the most notorious gangsters in America.” Ralph Cefaro's sons, including Bob Mazur's grandfather, Joe, worked for the Luciano outfit. After his stint in jail, Joe Cefaro moved with his family to Staten Island, where Bob Mazur was born and raised. Reportedly, little Bob was the apple of his grandfather's eye; he remembers his grandfather, who worked on the dry docks, taking him to his after-hours hangout to show off his accordion playing. Mazur grew up with a tremendous respect for his grandfather and his values of loyalty and dependability. He also grew up an avid athlete, playing football in the Pop Warner league with the likes of Tom Buchheit, who later became the starting quarterback at Kent State University. Mazur was known as a force to reckon with, despite his relatively small stature; he later was on the football and wrestling teams at Wagner. He attended Port Richmond High School, where he says he was a less-than-serious student. It was there that he met Evelyn, a couple of years his junior, and they started dating. He began college at Southern Illinois University in Carbondale — his parents wanted him to go out of state, he says, and “Illinois was as good a place as any.” His relationship with Evelyn, however, brought him back to New York. While she enrolled in Pace University, he transferred to Wagner College, a school he knew had an excellent academic reputation. In Illinois, he had gained not only new cultural awareness and related skills (he learned horseback riding, for example), but also a more serious attitude. “That's when I finally realized there is an importance in getting the best possible education,” he says. Mazur found his career path soon after arriving at Wagner College. As he writes in his book, one day on campus he “stumbled across a job announcement for a co-op position at the Intelligence Division of the IRS.” It allowed him to begin part-time and summer employment while he was still in school, leading to a possible full-time job after graduation. 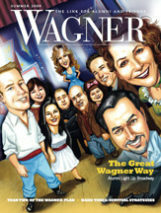 Lessons learned in Wagner classes helped him excel in infiltrating the criminal underground. He quickly became enamored of the idea of catching major tax cheats and criminals and working side by side with law-enforcement agencies such as the FBI. “I wanted a career that I could be proud of, that kept my interest, that didn't box me into the same boring routine every day,” he writes. He began working for the IRS the summer after his junior year. Work motivated him in his studies, and he immediately began seeing the links between classroom lessons and his job. His favorite professors included George Petrello, who taught accounting. “That course was so important to me for where I wanted to go career-wise,” he comments. 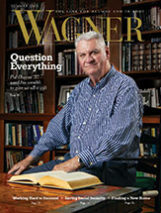 Another memorable professor, Mazur says, was Charles Kraemer, founder of Wagner's business and economics department. Professor Kraemer would talk about going to the zoo and watching people feeding carrots to the bears. One day, he realized that scenario was an economic metaphor for life: We're all just like the bears, performing for rewards. After some time with the IRS in New York City, where he was first exposed to the role of banks in propping up the drug trade through money-laundering services, he got a transfer to Tampa. “In sunny Florida,” he writes in The Infiltrator, “drug traffickers and money launderers were as plentiful as palm trees.” At his new post, he became interested in a joint operation of the IRS and U.S. Customs to infiltrate drug and money-laundering rings. Mazur desperately wanted in on this kind of work. “That position would put me on the front lines, and that's exactly where I wanted to be,” he writes. He was sent to undercover school, which he took just as seriously as his accounting and business classes at Wagner College. Over the next seven years with U.S. Customs, he became immersed in what FBI Director Robert Mueller has called “one of the largest money-laundering prosecutions in U.S. history.” In the undercover role of wealthy, mob-connected businessman Robert Musella, Mazur infiltrated high into the ranks of the Medellín drug cartel, while simultaneously uncovering the dirty dealings of a major international bank. 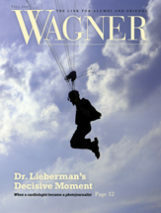 This narrative is the main focus of his book, The Infiltrator, a step-by-step account of how he nailed top drug lords, brought down the Bank of Commerce and Credit International, and even contributed information that led to the conviction of Panamanian general and dictator Manuel Noriega for drug smuggling. After reading Mazur's book and meeting him in person, this question continued to nag me: What kept him going in the face of the dangers and difficulties, especially when his work was not appreciated and even undermined by others in law enforcement? He didn't think about it, says Mazur. “In order to do what I did at the highest level, you have to take calculated risks, and I thought I took calculated risks,” he says. “But if I were the supervisor and I had me to supervise, I'd probably have a lot of sleepless nights.” He laughs. In writing his book, Mazur again reveals his willingness to take calculated risk for the sake of achieving a higher purpose — and also his refusal to quit on anything, no matter how hard it is. After all, he didn't have to uncover old wounds that could possibly endanger his life again. Although his book's revelations date back to the 1980s, many of the key players are still around and retain powerful connections, especially in Colombia. Reviving memories of this dirty past is enough of a risk that Mazur appears in the media only with his identity disguised. But, after he retired from government service in 1998, he knew that he wanted to tell his story some day. “I wanted the public to know what that world is really all about,” he says. He also wants the public to understand that the problems of money laundering are far from over, and that it props up not just drug trafficking but also terrorist activities. For several years, however, he was too busy establishing his own business, the investigative and consulting company Chase & Associates, to consider writing. It was Oscar-nominated movie director Michael Mann (The Aviator, The Insider) who inspired him to start. Several years ago, Universal Studios hired Mazur as a technical consultant for the 2006 movie Miami Vice, a crime thriller directed by Michael Mann. Mazur spent several months on this project, getting to know Mann and actors Colin Farrell and Jamie Foxx as they created a fiction about the character types that Mazur knew so well: undercover agents, money launderers, and drug lords. After talking with a couple of potential co-authors, Mazur eventually connected with a literary agent, who quickly sold the book to Little, Brown and Company. They told him that, first of all, he didn't need a co-author. He was a strong enough writer to complete the book himself. Secondly, they wanted it done in six months. “That's where my English courses came in,” he says, noting that he enjoyed writing in college. With coaching from his editor, he managed to complete the manuscript in close to six months while keeping his business going. He wrote daily from 7 to 9 a.m., and from the close of business until 2 a.m. Since its publication, The Infiltrator has received high praise in the Florida and New York media and from law enforcement groups, and major directors and production companies optioned the film rights. The film project finally started in 2015, with Brad Furman as director, Bryan Cranston starring as Robert Mazur, and Miriam Segal's Good Films along with George Films as the producer. The film also stars Diane Kruger, John Leguizamo, and Amy Ryan. Mazur uses every opportunity to educate the public, law enforcement, banks, and governments about the prevalence and the dangers of money laundering. 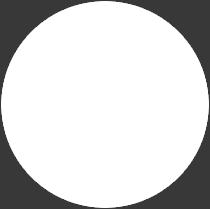 For example, in June he appeared (without showing his face on camera) on PBS's Need to Know to comment on a recent major money-laundering case, with drug profits funneled through Wachovia Bank in Mexico. As his wife, Evelyn, says, he hasn't changed: He's goal-focused, daring, and dedicated to his cause. Only now, he gets to come home every night. “I saw it as an opportunity to do something that could be potentially significant,” he says of his undercover work. “I had an opportunity that was given to me, entrusted by the people to do a job as a federal agent. Note (May 5, 2016): This story is an expanded and updated version of ‘From the Editor’ in the Summer 2010 issue of Wagner Magazine.